The England international was heavily tipped to join the Red Devils last summer but the Foxes were adamant that the defender was not for sale after already witnessing the departure of Riyad Mahrez in the same transfer window. According to The Star, this has not completely ended the interest from United for Maguire, but the club would still have to pay a hefty price with the Foxes demanding at least £90m for the defender, who has four years remaining on his existing deal. United have also been linked with the likes of Kostas Manolas, Kalidou Koulibaly and Toby Alderweireld but Maguire could emerge as the preferred choice with the age and Premier League experience on his side. 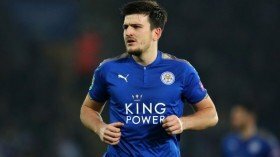 Maguire has made 71 appearances for the Foxes since making the switch from Hull City in the summer of 2017. He has already earned 17 caps with the England national side.